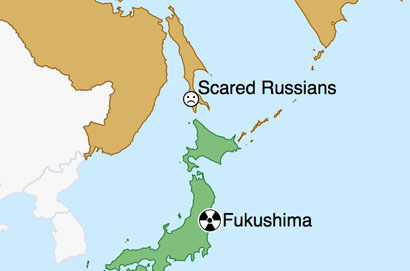 Lost States: Nearest foreign country to Fukushima? Nearest foreign country to Fukushima? What foreign country is nearest to Japan's nuclear reactors at Fukushima? Most people might guess China or South Korea, but neither is correct. It's Russia. Specifically, the Russian island of Sakhalin. Right now, the citizens of Sakhalin are panicking—because Russia hasn't got a very good track record on keeping its citizens in the know. There might be a lot of radiation in Sakhalin... or very little. Who knows?! What we do know is that in countries without a vigorous free press, all kinds of crazy rumors can take hold--and that's what's happening right now in Sakhalin. Like the rumor that the Russian government is shooting at the throngs of people trying to flee. It's just a rumor... we hope! Read more here.